I’m so excited to be showing my work this weekend at Polar Fest, a wintry event at the Berea Fairgrounds bustling with entertainment and local vendors! As always, my original paintings and creations will be for sale throughout the weekend, but this show is so much more than just a place to display art pieces. I’ll also be operating a make-and-take booth, where I’ll not only teach you how to create your very own fluid art pieces, I’ll also provide everything you need to make an 8×10 canvas to take home with you! 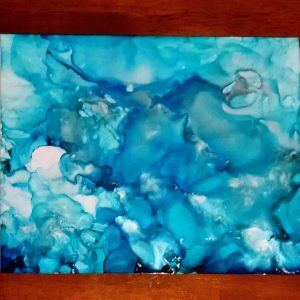 Supplies and instruction are included in the $10/piece price, so if you’ve ever wanted to try your hand at an exciting and fun abstract art style, be sure to stop by! 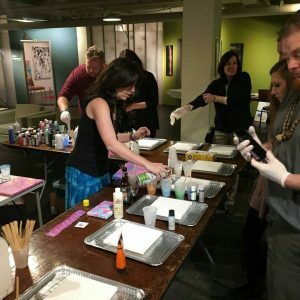 A fluid art make-and-take workshop at 78th Street Studios. Additionally, I’ll be debuting a new performance art project I’ve been working on for a while. In partnership with Michael McFarland Music, I’ll be creating gorgeous abstract ink paintings by responding to live music on stage. 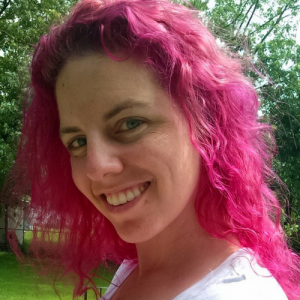 My work will be projected onto a large screen for the audience to experience my creative process in real time. We have demoed this project a few times in front of friends and fellow makers; so far everyone has found the performance entrancing and, at times, surprisingly emotional. It’s a visual-audible fusion that draws the viewer deeper into both the art and the music. Not quite sure what this all means? Come to Polar Fest and find out – we’ll be onstage from 10am to noon on Saturday. Created to the song “Blue” by Eiffel 65. New pieces are coming out of my studio almost every day, and I have so many wonderful works to share! If you can’t make it to Polar Fest, but want to see all the magical pieces I’m creating, follow my Instagram account for daily updates and new items.